The Taganrog NTK of Beriyev on a site of state purchases placed the order for performance of a part of ROC on ergonomic equipment of development of the A-60SE plane. Under this code from Soviet period the flying laboratory – the carrier of the laser weapon intended for fight against spy satellites disappears. The Russian newspaper reports about it. «Development of a laser subject is conducted with the beginning of the 70th years. It is theoretically supposed that the powerful laser put into orbit can put out of action equipment of supervision and communication of spacecrafts of the probable opponent. In 2009 experiment confirmed possibilities of the new weapon – the laser beam induced from board A-60 was fixed by the satellite flying at height of 1500 kilometers», – the newspaper writes. For performance of this mission Il-76 was seriously finished in NTK of Beriyev: «In a plane nose instead of a regular meteoradar established a fairing with the prompting laser. Fuselage top between a wing and Kiel made revealing, as at "Shuttle". Huge shutters hide a sliding turret with the main laser. On each side a fuselage under a fairing established powerful turbogenerators for a special equipment food. The first flight A-60 made in August, 1981, the plane is based on airfield Pushkin near St. Petersburg». 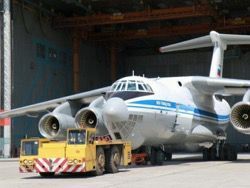 According to the newspaper, "SE" index in the demand of the enterprise is the modern name of the Sokol Eshelon project which assumes use for new A-60 the last updating of the transport worker – Il-76MD-90A of the Ulyanovsk plant "Aviastar".